Amit M Shah, Rima B Shah. Background: Periodical analysis of the published articles can be very informative regarding the research agenda, the group of participants involved in research, and their priorities & interest in the type of research field. Aims & Objective: To review trends in publication of the NJPPP focusing on manuscript country of origin, subject interest, contributions by institutions, and use of structured abstracts. Materials and Methods: All volumes and issues of the NJPPP were retrieved (2011–2013). Each article was reviewed for the type of articles, geographic region of origin of the author, and the presence of a structured or unstructured abstract. Results: There were increase in number of articles with every issue and every volume. Of the 62 articles, 45 were research articles while 7 were review articles. Most of the research articles were written on descriptive studies. All the abstracts of the research articles were written in a structured format and for rest of the articles it was written in unstructured manner. Articles were generated from 5 different countries: India, Serbia, Malaysia, Egypt, Ethiopia, China, and Algeria. Majority of articles were related to the Physiology (22), Pharmacology (14) & Pharmacotherapeutics (7) and Pharmacy (5). Conclusion: Analysis of the published article of NJPPP revealed trends in article types over a 2 year period. Manuscripts were submitted primarily by authors from Indian colleges and the majority was from Gujarat. Majority of articles are research articles and related to the subjects as of the name of the journal. 1. Keating JC Jr, Caldwell S, Nguyen H, Saljooghi S, Smith B. A descriptive analysis of the Journal of Manipulative and Physiological Therapeutics, 1989&#8211;1996. J Manipulative Physiol Ther 1998;21:539&#8211;52. 2. Keating JC Jr, Larson K, Stephens M, Mick TJ. Journal of Manipulative & Physiological Therapeutics: a bibliographic analysis. J Manipulative Physiol Ther 1989;12: 15&#8211;20. 3. Rourke L, Szabo M. A content analysis of the Journal of Distance Education 1986&#8211;2001. J Distance Educ 2002;17:63&#8211;74. 4. Mrozek JP, Till H, Taylor-Vaisey AL, Wickes D. Research in chiropractic education: an update. J Manipulative Physiol Ther 2006;29:762&#8211;73. 5. Jaiswal A. Secondary prevention of coronary artery disease (CAD): Evidences, evidence based guidelines, and real life practices.. Natl J Physiol Pharm Pharmacol. 2011; 1(1): 9-22. 7. Karan J, Panwar A, Yadav P, Kantharia ND. Metaphors and symbols in drug promotional literature distributed by pharmaceutical companies. Natl J Physiol Pharm Pharmacol. 2011; 1(1): 32-34. 8. Shah H. How to calculate sample size in animal studies?. Natl J Physiol Pharm Pharmacol. 2011; 1(1): 35-39. 9. Charan J. The Journal Club. Natl J Physiol Pharm Pharmacol. 2011; 1(1): 40-41. 10. Yadav P, Sinha A, Karan J, Mody P, Panwar AS, Kantharia ND. Awareness about emergency contraceptives pill in women who came for medical termination of pregnancy. Natl J Physiol Pharm Pharmacol. 2011; 1(2): 68-78. 11. Tekriwal R, Parmar DM, Saxena R. Noise induced hearing loss - A comparison between speech frequency & 4000Hz frequency. Natl J Physiol Pharm Pharmacol. 2011; 1(2): 79-85. 13. Mody P, Daga A. Supreme Court of India legalizes passive euthanasia. Natl J Physiol Pharm Pharmacol. 2011; 1(2): 91-91. 14. Vora MB, Shah CJ. Effectiveness of workshop training in basic principles of Good Clinical Practice among the Medical teachers - A cross sectional study. Natl J Physiol Pharm Pharmacol. 2011; 1(2): 92-96. 15. Kotur NS, Sappandi NB, Sappandi SL, kallaganad G, Rao. C. Slow vital capacity parameters as indicators of pulmonary efficiency in obese people &#8211; A case control study. Natl J Physiol Pharm Pharmacol. 2012; 2(1): 29-32. 16. Kumar A, Shrivastava A, Purwar B, Arora N. Effects of Curcumin on the intestinal length andmorphology: An experimental study in albino rats. Natl J Physiol Pharm Pharmacol. 2012; 2(1): 39-44. 26. Dutt AR, Kumar NS, Ramaswamy C, Bhat MR, Murthy N. A Comparative study of Blood Pressure, Heart Rate Variability and Metabolic risk factors in Software professionals. Natl J Physiol Pharm Pharmacol. 2011; 1(2): 51-56. 27. Kumar NS, Dutt AR, D'souza NDR, Bhat SK, Hemraj SK. A study of meat consumption on cardiometabolic risk factors in pre-menopausal type-2 diabetic patients.. Natl J Physiol Pharm Pharmacol. 2011; 1(2): 57-62. 34. Bhardwaj P, Asthana N. CRI (Computer Related Injuries): Wreaking havoc on young generation&#8217;s health. Natl J Physiol Pharm Pharmacol. 2011; 1(1): 42-44. 35. Pandey A, Chaturvedi M, Prakash H, , . Febuxostata new treatment for hyperuricaemia in gout - a review article. Natl J Physiol Pharm Pharmacol. 2012; 2(1): 23-28. 43. Jadhav SP, Nikam K, Gandhi A, Salunkhe K, Shinde. N. Applications of computer science in Pharmacy: An overview. Natl J Physiol Pharm Pharmacol. 2012; 2(1): 1-9. 50. Hulke SM, Patil PM, Thakare AE, Vaidya. YP. Lung function test in petrol pump workers. Natl J Physiol Pharm Pharmacol. 2012; 2(1): 71-75. 53. Kumar A, Shrivastava A, Purwar B, Arora N. Effects of Curcumin on the intestinal length and morphology: An experimental study in albino rats. Natl J Physiol Pharm Pharmacol. 2012 [cited January 08, 2013]; 2(1): 39-44. 54. Mathur S, mathur T, shrivastava R, khatri R. Chlorhexidine:The gold standard in chemical plaque control. Natl J Physiol Pharm Pharmacol. 2011 [cited January 08, 2013]; 1(2): 45-50. 56. Mehanna MM, Motawaa AM, Samaha. MW. Pharmaceutical particulate carriers: Lipid - based carriers. Natl J Physiol Pharm Pharmacol. 2012 [cited January 08, 2013]; 2(1): 10-22. 57. Mostafa HMA, Tayel SA, Abdelrahim ME, Khamees A, Maraghy MAE, Meabed. MH. The role of piracetam in treatment of sickle cell anemia. Natl J Physiol Pharm Pharmacol. 2012 [cited January 08, 2013]; 2(1): 58-65. 58. Abdella SH, Wabe. NT. Prescribers adherence to the basic principles of prescription orders writing in South West Ethiopia. Natl J Physiol Pharm Pharmacol. 2012 [cited January 08, 2013]; 2(1): 66-70. 59. Wabe NT. Khat use in Ethiopia: Which direction to take?. Natl J Physiol Pharm Pharmacol. 2012; 2(1): 76-77. 61. Govindaraja C, Jaiprakash H, Annamalai C, Vedhavathy SS. 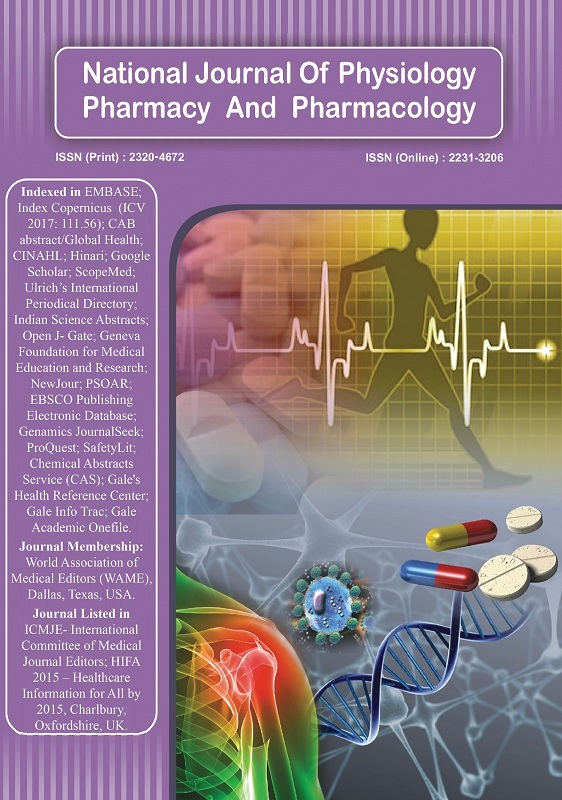 Computer assisted learning : Perceptions and knowledge skills of undergraduate medical students in a Malaysian medical school.. Natl J Physiol Pharm Pharmacol. 2011 [cited January 08, 2013]; 1(2): 63-67. 62. Li B, Li N, Wang S. Pharmacokinetics of injectable beta-cyclodextrin-oridonin inclusion complex, a novel formulation of oridonin in Wistar rats. Natl J Physiol Pharm Pharmacol. 2012; 2(1): 52-57. 63. Salima T, Mounira K, Nadjia D. Assessment of Nutritional Status of Pregnant Women Attending the City Tebessa PMI (Algeria). Natl J Physiol Pharm Pharmacol. 2011; 1(2): 97-105.